It was last Sunday. We were sitting on the couch in our living room. Chuck was reading to me from Elmer Green’s book, The Ozawkie Book of the Dead, the title a take-off on The Tibetan Book of the Dead, Ozawkie being the name of the town where Dr. Green was living when he wrote the book. 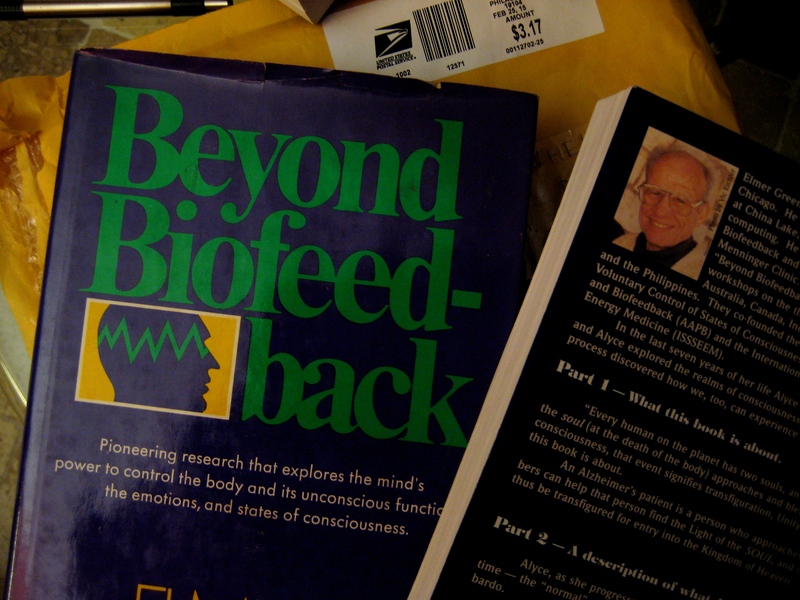 Dr. Elmer Green, now in his late nineties, is a very advanced spiritual guy, a physicist and psychologist involved in early biofeedback experiments and always a seeker of meaning. The subject of the chapter we were reading was synchronicities, how they occur and what they mean. It was actually a long string of synchronicities that had brought us to discover Dr. Green and the work he was involved in, along with his wife Alyce, both of whom had worked at the Menninger Research Institute in Topeka, Kansas. Back in the 1970s I had purchased and read a book by their son, Doug Boyd, called Rolling Thunder. The book was on our bookshelves when Chuck happened to pick it up one day and began reading. He couldn’t put it down. That was the beginning of a long string of synchronicities that led us to where we were last Sunday. It was a snowy day. As with most Sundays, we were committed to spontaneity without commitment to anyone or anything, but also with rest and rejuvenation as our underlying intentions. Chuck had been reading for a while when his voice began to get raspy and hoarse. Soon he could no longer speak. He wanted to keep reading but was forced to stop. Some time passed before Chuck decided to take up the book again and begin reading. This time we started on the next chapter, an autobiographical section about Alyce Green, taken from their previous book, Beyond Biofeedback, in which she tells the story of her upbringing and her early life before meeting Elmer. I had ordered a copy of that other book, which had yet to arrive. I was especially interested in hearing her story. With all that we knew of the Greens, she remained somewhat mysterious and I was really curious about who she was and how she had gotten together with him. Once again, Chuck began to read. This time his voice only held out for a little while and soon he stopped. I was disappointed. I wanted to grab the book and keep reading, but we had decided that we would read this book together, as it was so deeply informative and rich in spiritual insights. I had to be patient. Just as Chuck said, “I’ll go get it,” and got up from the couch, a hawk flew right past the window, low to the ground, its wings swooping the snow now piled high around the house. It startled me, but I wondered what it could mean. A synchronicity for sure! 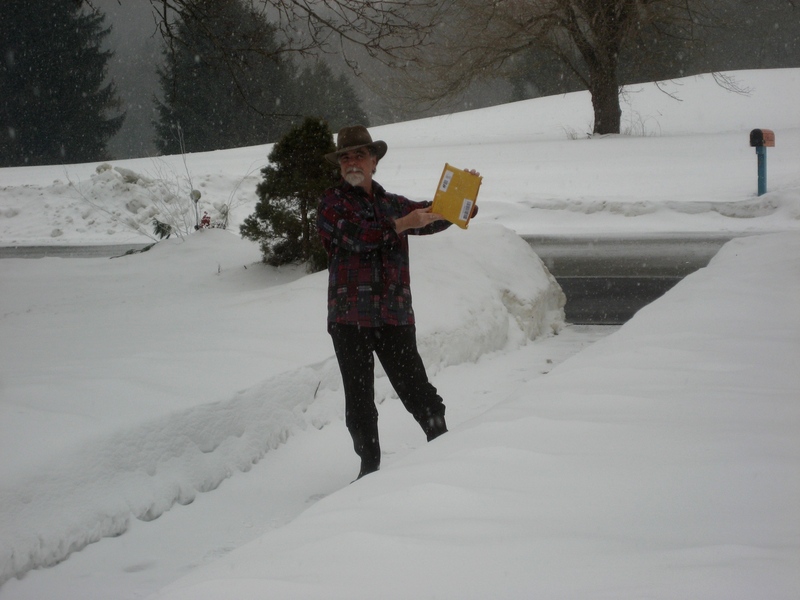 Chuck donned hat and boots and when out into the snowstorm to get the mail. The only thing in the mailbox was a book. He brought it in. We wondered what it was. We opened it. 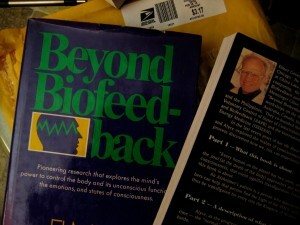 It was the Green’s book, Beyond Biofeedback. Just what I had been waiting for. “Now you can read all about Alyce!” Chuck said. The synchronicities abound in this experience. First we had been reading about synchronicities, then a series of unexplainable things occurred. Chuck’s voice gave out, for no apparent reason, just when I was finally getting to hear the story of Alyce, which I had so yearned to hear. I had even wanted us to jump ahead to that chapter earlier so I could hear about her, but then patiently held back. Then I remembered the mail. I envisioned a book in the mailbox, but not what book exactly, as I had recently ordered several. A hawk flew in front of the window, a messenger delivering a message. “Yes, there is a book in the mailbox!” the hawk was saying. And lo and behold, it was the one book I could have wished for, the one that would grant me the pleasure of reading about Alyce. Now I come to last night and the subject of my dreams. In another synchronicity, another book I had recently ordered arrived yesterday. It was Robert Monroe’s first book—which neither of us has read—about his earliest experiences in out-of-body travel, called Journeys Out of the Body. Long familiar with Monroe, founder of the Monroe Institute, and his Hemi-Sync recordings, as well as his history as an out-of-body traveler, we were, synchronistically, reconnected with him through reading Elmer Green. Monroe had sought help with understanding his experiences and ended up at the Menninger Institute in the 1970s working with the Greens, just at the same time that I was reading their son’s book about Rolling Thunder, a Native American Medicine Man. As you might be able to tell, we find all these synchronicities very interesting and also “very entertaining,” a phrase often spoken by Elmer Green. To return to last night’s dream. As we were preparing to sleep, I said to Chuck, “Even though we haven’t read Monroe’s book yet, just having it in the house is enough that we may have out-of-body experiences tonight, as it is imbued with that intent. Just touching it is enough for the power to rub off.” Chuck agreed. We’ve had the same experience with other such books, Castaneda’s books and William Buhlman’s Adventure’s Beyond the Body being but a few. As I traveled deeper into the cosmos, I experienced what Chuck wrote about in his blog this week, Being in Love. Indeed, we are all beings in love, part of the greater love that is. I experienced just that, without attachment to anything other than those universal truths of loving kindness and compassion, for all and everything, that we are told to strive for as fulfillment in life on earth. In my dream, I was fully aware that we are all just that. As I opened more and more into this awareness in my dream, without fear or attachment, and also into the cosmos, I experienced the synchronicities that had gotten me there, everything from Doug Boyd to the Greens to Robert Monroe, all beings who explored meaning beyond this world. And not least, I experienced myself, my own journey and all the people in my life as part of my own getting there, beyond this world in this loving way. I knew there was no need for fear or attachment to this world, that all that is really is love and loving. If we are ready for it, it receives us without bias, simply because it exists. Love is! And we are all part of it. My dream was just the next in the series of synchronicities that have abounded in our recent experiences. Life itself is, if we care to see it that way, a string of synchronicities. Yes, synchronicities do abound, not only in my life and in Chuck’s life, but in each of yours as well. You just have to see it that way. And I think you might just be able to do that if you pay a little attention to what is happening in your life on a moment to moment basis, how everything is connected, just as our Sunday experiences and my dream showed me. Everything is connected by the energetic fact that we exist as part of the greater universal wholeness that is the cosmic world we live in, participate in, and experience every day in the synchronicities that abound, if we are aware of them or not. It’s actually a really fun project to decide to undertake, to remain aware of what is happening on a daily basis. See where you are led, what comes to show you your own part in all of this grand scheme of all that is. No matter who you are or where you are in your own journey, you are part of this. If you exist in this world, you too are love. Set the intent to have an experience of that love that is, that you already are simply because you exist. It’s already in you. That is what my dream is telling me. There is no other work to be done but to open up to it. And then to become it, in all that you are and all that you do. Become the love you seek. It’s that simple. This is what Chuck wrote about, and this is what I dreamed about, all in synchronistic alignment with the truth of all that is: Love! We are all energetic beings. We are all droplets in the greater ocean of awareness, synchronicity, and the love that is. Another synchronicity! Here is a cool little video I came upon this morning, the theme is, you guessed it: LOVE! But more importantly, that we are all energy bodies having a human experience, and that all the many shapes and forms we come in don’t really matter. Our little visitor arrived on Sunday February 1, 2015. We called her Fifi, a little ring-necked pheasant with an injured foot. We wondered how long she’d stay. Day after day she’d arrive from wherever she was hiding out to eat at the bird feeders we have hanging in our yard, joining the other birds on the ground, those too big to cling on the feeders and those who just couldn’t get a spot on the crowded perches. Occasionally, she’d sit in the sun, either on the front porch or close to the house. One day I found her hideaway, a basement window well, tucked up close to the warm chimney and out of sight. I saw her sitting there when I happened to be in the basement. It seemed like a good spot, well-chosen. 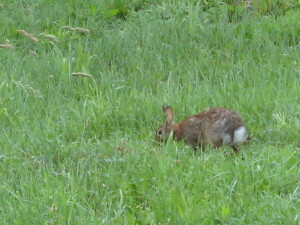 After that I noticed she spent most of her time there, only venturing out to eat bird seed for about an hour a day. We wondered how she was surviving on so little, but then I noticed her feasting on dried grasses, pecking at the frozen soil. I read that pheasants, with their long sharp beaks, can dig down about 3 inches, even through frozen ground to find nourishment. “She’s just a sitting duck,” Chuck said one day, “it’s only a matter of time.” We agreed that she was nonetheless a plucky little bird and we watched her with concern, every day that she appeared another sign of her tenacity. Her foot, though, never seemed to heal. She could barely stand on it. One day, I had a vision of looking out the window to find her being mauled by a hawk. She was vulnerable, both night and day, to the extremely sensitive smell and sight of the predator birds. We heard there was a bobcat in the neighborhood too, and we worried about a cat attack as well. She seemed to do well when faced with the neighborhood cats, some of them real hunters. The most frequent cat visitor is an inept novice, but a bobcat was another matter. Her wings worked just fine, though her takeoff was a little clumsy, especially in deep snow. Wednesday February 18th arrived. It was Ash Wednesday, a New Moon phase was about to begin and it was the eve of the Chinese New Year, by all accounts a most auspicious day. I channeled a Soulbyte early in the morning, before sunrise, part of which read: “…nature has an unusual way of delivering its messages! So be aware of its gifts, that they may arrive in strange packages.” You can read the whole Soulbyte here. As the sun rose I went to peak out the window at Fifi, as was my usual habit. I’d come to enjoy her presence and each day I marveled at her surviving yet another cold night, some of the coldest we’ve had in a long time, dipping down into below zero temperatures for several days in a row. It was still not quite light, but I could see destruction as soon as I looked out the window. 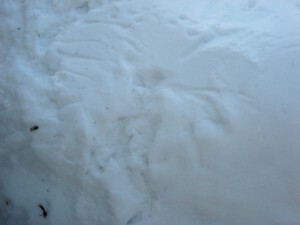 Her headless carcass lay mauled in the snow drift behind which she had found safety and protection. She was surrounded by an explosion of feathers. “She’s gone, something got her!” I yelled, my vision of the hawk coming to mind. We both felt immediately sad, our Fifi was no more. “But what does it mean?” Chuck said in his usual inquisitive manner. Yes, what does it mean indeed! It was then that I remembered the hawk that had been visiting lately too. For three days it had come and perched in the trees in the yard, scaring the other birds. I realized that it had been smelling death, that Fifi was growing weaker. 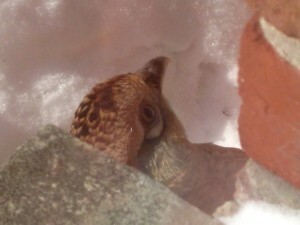 I had actually noticed her sitting the day before with her face to the wall, her back in the sun, rather than alert in her nest in the window well, and I sensed she was growing sickly. Last Sunday we had actually written about the hawk, after receiving an ominous sounding channeled Soulbyte. The hawk figured quite prominently in our process that day. You can read about it here: Waiting. It became my job to take care of Fifi’s remains. We couldn’t leave her by the house. Chuck had early sessions and I am usually writing on Wednesday mornings. Around eight I got a shovel and went out. Climbing through the deep snow I made my way over to where she lay. No animal tracks disturbed the overlay of light fluffy snow. 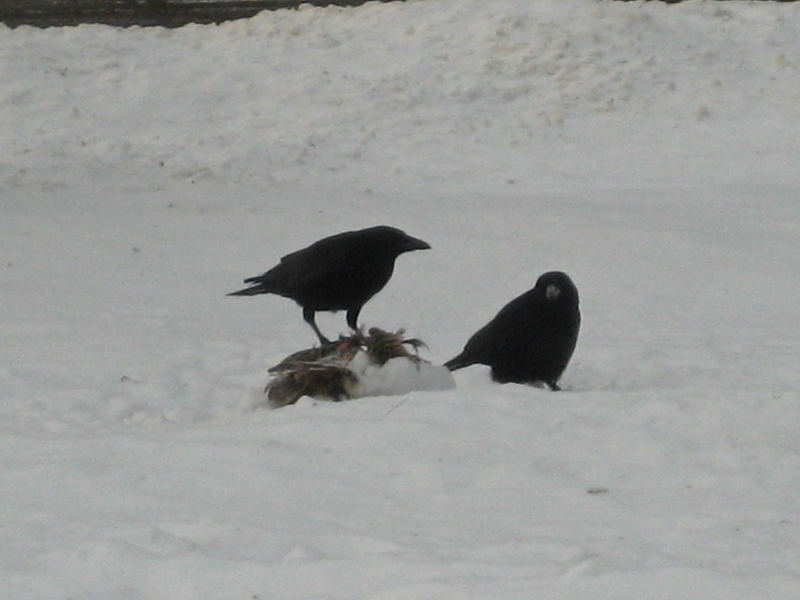 I saw that her decapitated head lay among a profusion of feathers, the rest of her lay on top of the snowdrift, gutted and bloody. Something had ripped her open and eaten its fill. 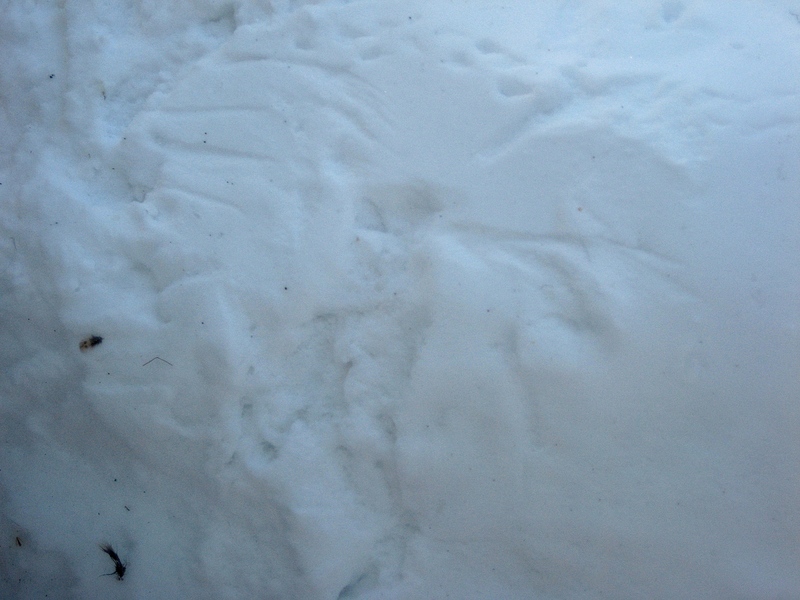 It did not look like a cat or bobcat got her, as there were no tracks in the snow and I doubt a house cat could have done such damage. A bobcat, I suspect, would have carried her off. The hawk? Did hawks feed at night? It was then that I saw the imprints in the snow of a wide wingspan. A predatory bird had gotten her. Perhaps it was the hawk, or even an owl. We will never know for sure. Like a forensic scientist I took pictures. I am more curious than disturbed by guts and gore. Then I had to decide what to do with her. 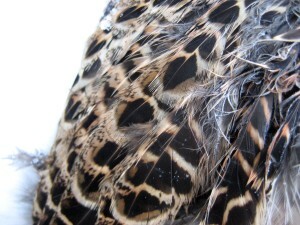 The feathers would stay covering the ground next to the house. Let the wind take them. Let the earth take them. But Fifi was dead now and she needed a fitting animal rite of passage. I shoveled up her remains, putting her severed head on top, and moved her out to the front yard, not too far from where she had pecked at seed for the 18 days she had spent in our presence. I would give her a burial that was similar to that which was common in old Tibet, the corpse left on the mountainside, too cold and rocky to dig into, to be picked at by vultures. In this way Fifi’s remains would feed others and eventually be deposited into the earth, a most fitting and natural burial. Soon the scavengers arrived, first the crows and then the hawk. I bid her farewell, sending her off on the next leg of her journey with thanks and gratitude for having come and been a part of our lives, showing us not only the tenacity of life to live to the fullest, but also the inevitability of death. The day progressed, Chuck and I talking occasionally about our process regarding what we had experienced with Fifi and our sadness at her end, inevitable though it was. Death comes to us all. And we noted the significance of the day, a day of transition, shift, and new beginnings as well. The first thing she said to me was, “Where were you at 8:30 this morning? I was calling you. I got hit by a car!” I was stunned. Concern for her immediately welled up, my first thought being that I had not been available for her when she needed me. She had been walking to work, the day after Fat Tuesday, the last and biggest day of Mardi Gras revelry in New Orleans, when a presumedly drunk driver jumped the curb and onto the street corner where she was standing, sideswiping her body with his car. She said he didn’t stop, but looked out his window at her as he sped off. Two women, who witnessed the accident, came to her rescue. They sat with her on a bench and made sure she was okay. Did she want to go to the hospital? Did she want to call the police? No, she was just shook up. They sat with her until she felt calm enough to get up and continue on her way. When I told her what I had been doing at 8:30, taking care of Fifi, she immediately blurted out, “I knew you were doing something important, something so that you knew about me. The pheasant died but I lived!” We agreed that Fifi gave her life so that my daughter might live. It was as fitting a meaning as we could find at that moment. Although death stalked her that day, came very near, my daughter did not flinch. Like a shaman she looked right back at death and yelled at him. She was not overcome. She’s not a victim. She’s a warrior. And like a warrior she got up and continued on to work! I look to the day itself, a day of transition, transformation, and shift for deeper meaning for all of us. Something was bound to happen, that’s what the energy of the day was all about. On that same day, Chuck published a blog about death as an advisor, written long before any of this happened. You can read that here. How can death possibly be an advisor? Death stalks us all—all the time. Nobody is special. We all die. It was Fifi’s time, but it was not my daughter’s time. Death, however, took a look out his window at her as he sped off, challenging her. “I didn’t get you this time,” Death said, “but I’m real. So what are you going to do now?” This is an important wake up call for all of us, delivered on a day of transition. It’s time to break the routines, to leave the old world behind, to move on without regret into new life, a life of meaning, compassion, and spirit. My daughter was not in the wrong place at the wrong time, she was in the right place at the right time to receive some important personal messages. In fact, we are all being delivered the same core message: We are all mortal beings who are going to die one day. Will we face death as courageously as Fifi and my daughter did? Death is all around us. Lately, it seems to be here in abundance. Are we finally ready to hear what death is telling us? The message now is very clear. Things have to change if the world is going to progress in the right direction. Can we use that knowledge? Death challenges us to break our complacent routines and move on to what matters most. It’s never too late. These are the events that guided us through the grand time of transition, through both departures and new beginnings. As I wrote this blog, I remembered that hawk is a messenger and, when hawk comes, often a message is to follow. Hawk stayed around for several days and we did get several messages, which I have tried to elaborate on in this blogpost. Like death it stalked Fifi and also brought messages of new life to my daughter. In our moments of awakening and transformation we realize there really is no death, no end, there is always new life. Our ultimate challenge: Can we find it in us to thank our antagonists, our messengers, death in this case, for guiding us to new life? I could go on and on, but this post is already very long, so I will stop here. Here is an essay by Oliver Sacks as he makes decisions about what is most important in his own life now, as he faces his own death: Oliver Sacks. In a dream I am in a packed country bus, descending down a windy dirt mountain road, in a third world country. A boy holds onto a door at the back of the bus. All of a sudden the door swings open as we round a wide curve in the road, and the boy, gripping tightly, swings in and out. The bus’s momentum is too great and we swerve off the ledge and go airborne, a huge chasm below leading to certain death. I close my eyes as I feel myself float out into the air. I am already vibrating and intent upon raising my vibratory level as we descend, awaiting impact. I wake up. I had already awoken earlier in the night with the intent to raise my vibratory level, to connect with Jeanne out-of-body. This dream ended my sleep for the night and soon Jan awoke too. We decipher my dream as my intent’s method of raising my vibration. It’s raining outside. 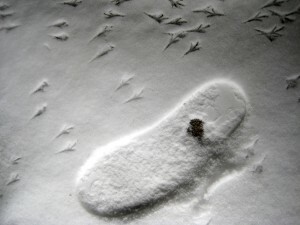 I head out to feed the birds and discover that the rain is freezing over as I slip and slide to the bird feeders. Later, as I head out to the office, I put the truck in four-wheel drive to climb the steep driveway. Regardless, I nearly slide back down. Suddenly I remember my dream. I get it! Be extremely careful driving, especially as the steep hills of my dream provide me with the necessary warning. I am more cautious than I’ve ever been as, without thinking at all, I turn to head down our road in the more gentle direction, away from the steep hill in front of our house. Jan informs me later that even the town salt truck would not go down the hill! I arrive at work. Suddenly it flashes, “Oh, it’s December ninth! This is the day Jeanne left this world!” I’d completely forgotten. But Jeanne didn’t forget. As I had attempted to raise my vibrational level to visit with her in the night, I was left suspended in the air in my dream, in this world. That was the necessary association I got as I drove to work: Drive slowly on the hills and curves. Indeed, the message was exactly right. It sent me into heightened driving awareness as I slowly edged toward work over the icy roads, with little traction in spite of my four-wheel drive vehicle. And to boot, I got the greeting from Pepe Le Pew, an unmistakeable association Jan knew nothing about! This is how ego and synchronicity differ. Ego has such a focused cause and effect filter that it misses the signs and symbols that appear to communicate vital information. I am quite certain that this morning’s Eureka moment in the driveway prevented a serious accident. Typically, the ego quickly shifts into judgment mode when analyzing a dream. Must be some kind of psychic inflation, set to take a tumble, if you’re about to crash in a dream. And what about the recklessness of the vehicle you’re being transported in? Aren’t you responsible for that? These questions narrow the view to a judgment of fault and badness. We know how the ego is always on the lookout to avoid exposure of its inadequacies! And then there is the case of Pepe Le Pew, that cute skunk of long ago cartoons. The ego has to admit to this amazing “coincidence,” but in suspending that judgment I knew it was Jeanne humorously assuring me that we were meeting after all! Once again, though the ego narrowed the field, saying, “Don’t feel bad, but you are too inadequate to raise your vibrational level to meet as intended,” I know for certain that I was delivered a message, a synchronicity between dimensions, that completely shifted my behavior and perhaps saved my life. All this, before I even realized that, thirteen years ago, this was the magical day of transition! A wise yogi once shared his hard-earned wisdom with me: “Beware the allure of asanas. The heart of yoga is in pranayama, the breath.” My humble wife, earnest student of svaroopa yoga for many years, warned me long ago that I should approach inverted asanas with great caution and support. Since young adulthood I have enjoyed inversions, particularly halasana, plough. Over a year ago, as I descended from that asana I strained my sacral muscles, initiating a long journey with back issues. Eventually, at my daughter’s hinting, I sought guidance from a teacher of the Alexander Technique. Most recently, particularly through the heart of the snow storms, I was amazed at the strength and resilience of my fully healed back. The other morning, as I dressed, I was buoyant with energy, balancing on one foot as I raised the other to put on socks while standing. I quickly lifted my right leg, excitedly thinking how powerful I’d become, when suddenly a powerful pain shot through my sacrum. OW! I’d done it again! I was thrown into immediate deflation, filled with negative judgments about my cocky stupidity. I was also in the midst of reading some lectures that Carl Jung, my intellectual nemesis, had given at the Tavistock Clinic in London in 1935. Ironically, he spoke of his own struggle with inferiority when a frequent guest at his home, Albert Einstein, would come and speak to him about his Theory of Relativity. Not being himself gifted in math, Jung said he “sank fourteen feet deep into the floor and felt quite small,” as Einstein tried desperately to communicate his thoughts. As I found myself sinking, I evoked Carlos Castaneda’s #1 dictum: “Suspend judgment!” That simple mantra is profoundly useful in allowing us to get to the deeper meaning of synchronistic events in our lives. Of course I feel foolish for hurting my back so carelessly. But what is the significance of the event? What am I being shown? To get to the deeper meaning of events we can’t stay stuck in judgment, it too limits and clouds our view. I am stirred to consult the I Ching to deepen my knowledge. I obtain hexagram #37, The Family. This hexagram speaks to the correct relationships within the family as the microcosm for all relationships in the world. I get a moving line in the 4th place: She is the treasure of the house… It is upon the woman of the house that the well-being of the family depends. Well-being prevails when expenditures and income are soundly balanced. What is this telling me? Not sure yet. We watch the documentary Cutie and the Boxer, about a married Japanese artist couple. I immediately don’t like the Boxer, he’s out of control, refuses to be limited. Cutie is held in check, keeping balance as best she can in their lives. I pull the 5 of Wands card from the Tarot deck, Strife, as well as the Moon card. Strife results from the energetic clash when Leo, the fiery energetic creative lion, is inhabited by Saturn, the planet of limitation, discipline and boundary. The lion held in check creates strife. The Moon is the universal principle of choice-making, particularly around karmic issues, that is, work that needs to be done. 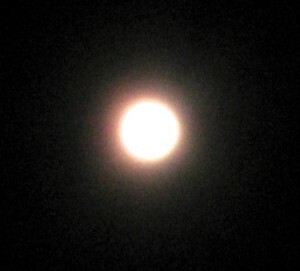 The moon is also the universal feminine symbol, yin. Back to the I Ching. I’m being shown that the yin line in the 4th place—the Moon of the Tarot—must take the ascendancy. The strife lodged in the spine is the clash between the fiery creative energy that, like the Boxer, abhors limitation. This leads to structural defeat that throws the body out of the Tao. The Moon, the yin, the internal feminine, must come to the ascendancy. Cutie is not to be subordinated to a subservient role but must take charge of internal affairs, asserting balance and limitation, making choices in accordance with the restoration of order, allowing for return to the Tao. If this is achieved, the future of The Family is Fellowship with Men, hexagram #13, depicting the restoration of order—balance and inner harmony—strife resolved. This series of synchronistic phenomena all mirror each other. 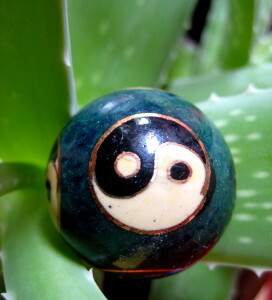 Yang energy must be properly complemented and balanced by yin energy. Dominance of the creative over the receptive might lead to a broken back! When I was a little kid I clearly saw that the ultimate goal of life was death. We were all headed in the same direction, going to the same end. What then was the meaning of life? I’d read the obituaries on the inside front page of the newspaper, studying peoples lives and how they had died, trying to make sense of it all. Then I’d flip to the back inside page and read the comics. Nothing in between was of interest to me. I knew I had to look for answers elsewhere. And so my search for meaning began. Little did I know that I didn’t really have to search at all. The answers were all around me, in the synchronicities of the interconnected universe that we all exist in. Yesterday, lunchtime arrived. I didn’t really feel hungry, but thought I should probably eat something. I prepared a small lunch. I ate a few bites but still had no appetite. Should I eat now when I have a chance or risk being hungry later when it won’t be appropriate to eat? I was on the fence. I picked up a favorite book, Everyday Tao, looking for guidance. I opened it at random, and received the perfect reading for my situation: Hungry/Full. I was fascinated by the response I received—both for myself and as regards the state of our country, reflecting our politics as well as the eating habits and health of the American people—but I really shouldn’t have been. I’ve been experiencing the synchronicities of the universe in alignment with my life for a long time, but nevertheless I get excited all over again every time I encounter the workings of the greater world we live in. Once again, it became clear to me that everything we experience is teaching us to become aware, teaching us how to prepare ourselves to become a part of the greater whole. The meaning of life is becoming part of that whole—one with the Tao—the answer that my chid self so diligently searched for. And one way to experience that is in the synchronicities of life itself. I woke up during the night. “This is the time I usually hear the owl,” I thought. And then I heard the owl hooting in the woods behind our house. “It’s probably hunting,” I thought. 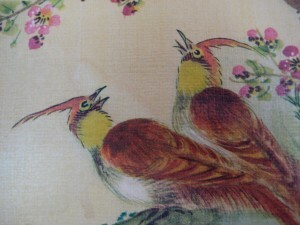 And then I heard a flurry of activity, the flicker of swooping wings, the screeching of an animal. 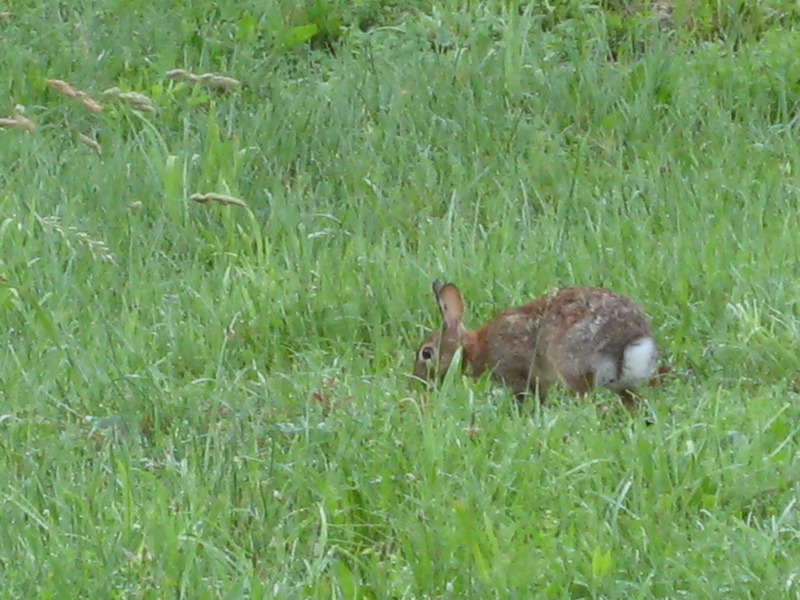 “It got one of the rabbits that live in the backyard,” I thought. “Don’t be sad. Let it go, it’s nature at work.” The tussle lasted but a few moments, then it was quiet again. Once again, I was fascinated by the synchronicities of the universe. Are my thoughts manifesting these things? I wondered. I think a thought, the universe responds. I know I did not cause anything, but I do know that I am part of the greater whole. When I ask the universe for guidance, I am tuning into the greater whole, aligning with intent, and this is why the answers appear so synchronistically. This is what my child self could not grasp, having little concept of the universe, of the oneness of everything. My child self could not understand that life and death were of the same energetic configuration, just different manifestations of the greater whole that we all are. Now, having had many experiences of the oneness of all things, I feel myself as part of everything. But even so, I tend to forget when dealing with the mundanities of life. We are all capable of forgetting even the most transformational of experiences when in the throes of life and what it challenges us with. But if we repeatedly bring our attention back to those experiences, back to our awareness of our oneness, we enter a new phase of experience. If we remember that we too are the universe, we insert ourselves in alignment with synchronicity. Once we are open and receptive, we experience synchronicities everywhere. We hear them. We dream them. We read them. We speak them. We hear them spoken around us, reverberating through the interconnectedness that we all are. When we experience our oneness we are in the Tao. And then life is not so daunting. Nor is death. It all becomes a fascinating experience. In the Tao, in alignment with the universe, the mysteries of life—what lies between the obits and the comics—are no longer mysteries. Everything is us, in us, around us. We are interconnected with everything else, everyone else. In energetic alignment we experience our oneness with everything, and the synchronicities come, because we are fully available to receive them. 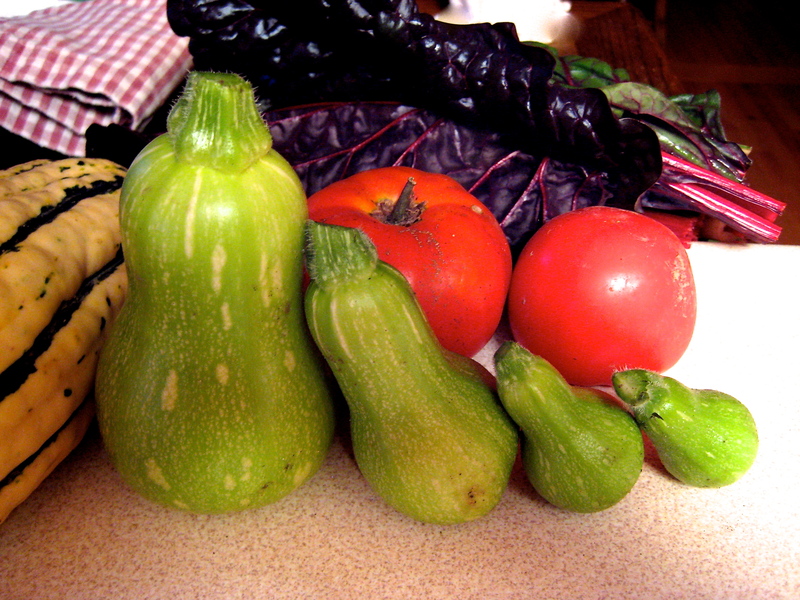 As I write, a squirrel comes knocking at the window, a hickory nut filling its mouth. “Hello Squirrel, I see you are in the Tao, preparing for the winter ahead.” The owl eating the rabbit, the squirrel gathering nuts, they are in alignment with nature. Are we?